Passig, D. (2001). Future Online Teachers’ Scaffolding: What Kind of Advanced Technological Innovations Would Teachers Like to See in Future Distance Training Projects?. 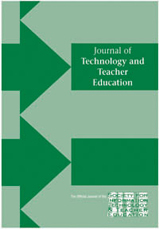 Journal of Technology and Teacher Education, 9 (4), 599-606. Norfolk, VA: Society for Information Technology & Teacher Education. Retrieved April 19, 2019 from https://www.learntechlib.org/primary/p/8409/.